Site of a Battle in 1522 between the O'Neills and the O'Donnells Knockavoe is the 1164th highest place in Ireland. 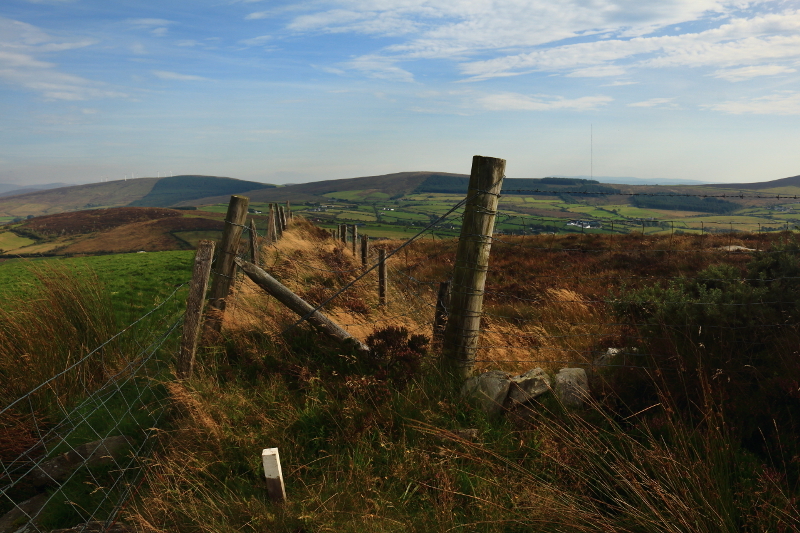 Knockavoe is the second most westerly summit in the Sperrin Mountains area. This is more of a 'you could do it this way but I wouldn't advise it' comment. Knockavoe is a wee hill I'd wanted to bag for years, often seeing photos of its metallic cross-topped trig pillar online. I got the chance recently when returning from Donegal. Out of a few different options for approaching it, I started from the NW, using a good track leaving the Curlyhill Road at H368984 C, and parking downhill a little to the west. This track started off promising, with excellent views northwest across the wide and winding River Foyle to Donegal, but it eventually reaches a dead end at a low hedge. Reaching the summit was thereafter cumbersome, with a few awkward fences to navigate (being a few inches taller would've helped) and it didn't feel like a route that's walked much or encouraged. 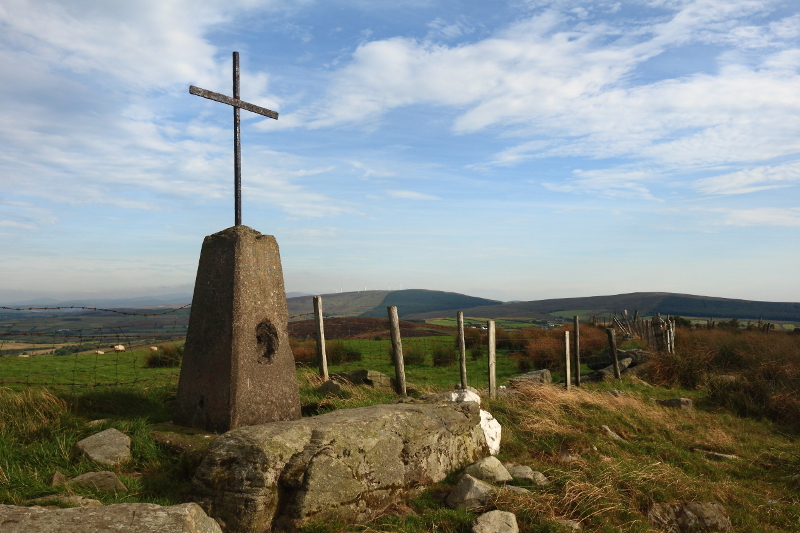 I finally reached a gate leading into a field with the trig pillar and the views didn't disappoint, though they were largely familiar from bagging nearby hills such as Owenreagh. Strabane was spread out below, with its twin town of Lifford across Foyle Bridge. The Bluestacks were prominent beyond, with the Derryveaghs visible northwest. The high Sperrins aren't best appreciated from this angle, appearing as a jumble of rounded hills. It was easier to pick out more outlying peaks such as Bessy Bell to the south. Strabane Transmitting Station, apparently Ireland's tallest structure, could be seen a short distance away to the SE on Koram Hill (I stopped there on my way home via Plumbridge and an info panel gives some history). I descended via the obvious track leading SW towards Evish Road, which would seem to be the most direct route up the hill. However, when the track split, I stayed right and followed the longer track which eventually comes out on the narrow north-south road to the west of Knockavoe, closer to my start point, at H360974 D. This passes close to the back of a house at the very bottom but I didn't have any issues. 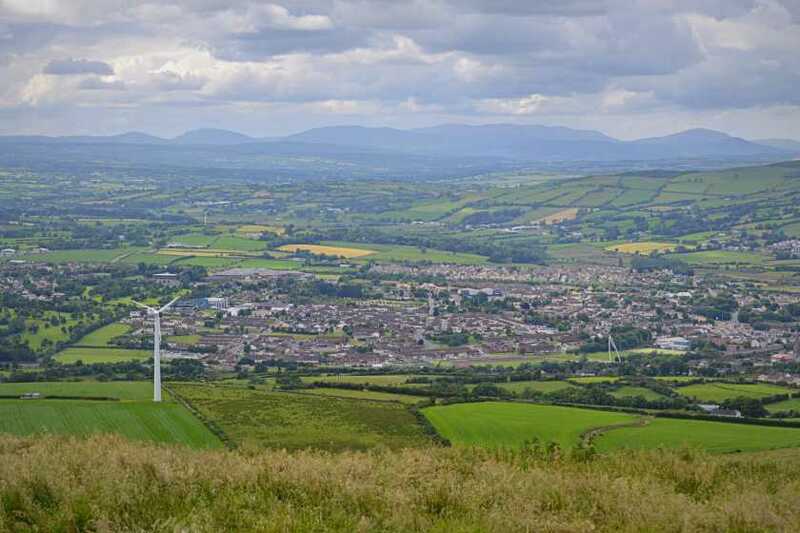 Picture from Aidy : Looking east to the Sperrins. Picture: Looking east to the Sperrins.